Interstate 80 retains 19 business loops across the Western United States, including a business loop freeway in Sacramento. Business Loop I-80 in Sacramento is a limited access highway encircling Downtown and Midtown. U.S. 50 overlaps with the business loop for the westernmost 5.5 miles. California 99 also joins the loop between Exits 4 (I-5) and Exit 6 (Sacramento Freeway). The route was established in 1980 over the former routing of Interstate 80 between West Sacramento and Sacramento near the community of Carmichael. This action occurred as the planned new alignment for I-80 replacing the substandard section along the eastern leg, including the Marconi Curve, was deleted by a Sacramento City Council vote taken in 1979.1 Instead of constructing a new section of freeway for I-80, the alignment was shifted northward over the Sacramento bypass, Interstate 880. Subsequent actions by the FHWA reclassified the old I-80 alignment from FAU (Federal-aid Urban) 6380 to FAP 51. State Senate Bill 191 followed these actions by deleting I-880 and formally rerouting I-80 over it.1 As defined in the California State Highway Code, legislative Route 51 was to be signed and designated as “Interstate Business Loop 80.” Route 51 runs from the U.S. 50/SR 99/Bus. 80 Northeast to the Interstate 80/SR 244 (Auburn Blvd.) junction along the Elvas Freeway. To complete the loop, the section of Route 50 between the Interstate 80/U.S. 50 junction in West Sacramento and the U.S. 50/SR 99/Bus. 80 junction is signed and designated Bus. 80 and U.S. 50. An application to AASHTO finalized the route changes. As approved on November 14, 1980, I-80 was rerouted over eliminated I-880, old I-80 was renumbered as Interstate 305 between the west end at former I-880 and the junction with U.S. 50 and SR 99 in Sacramento, while U.S. 50 was extended west. This kept the western portion of the route in the Interstate system as unsigned I-305. The substandard eastern section became unsigned California 51. 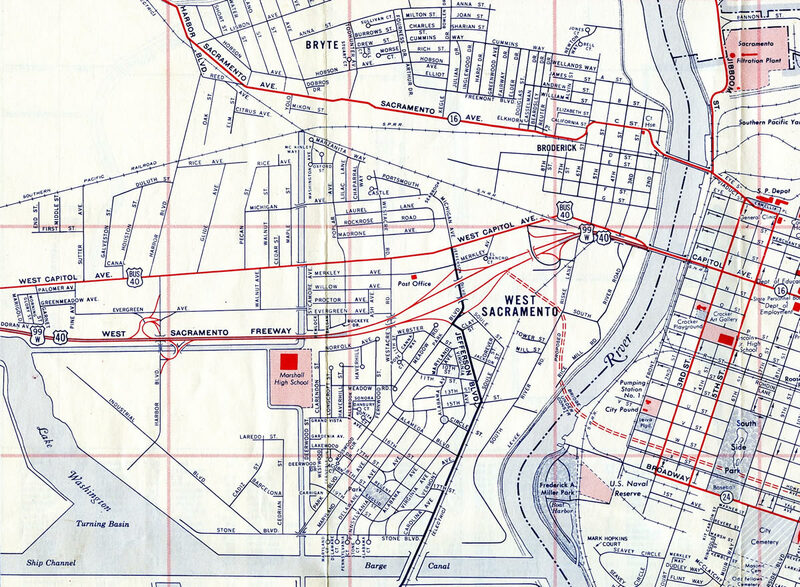 A possible earlier business route from Interstate 80 in Sacramento appeared on a 1963 Gousha map of Sacramento as U.S. 40 Business along West Capitol Avenue [see map at right]. 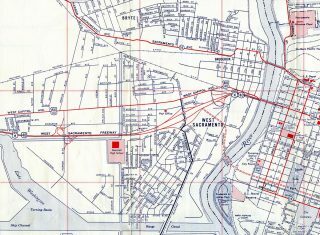 The route parallel the West Sacramento Freeway (U.S. 40 & 99W) to the north from what is now Exit 81 east to the Tower Bridge. This includes a portion that no longer exists east of 5th Street. According to Jerry Mullady, the route was later designated as Business Spur I-80. If the route was signed, it was not posted when the Business Loop 80 Freeway was commissioned in 1982. 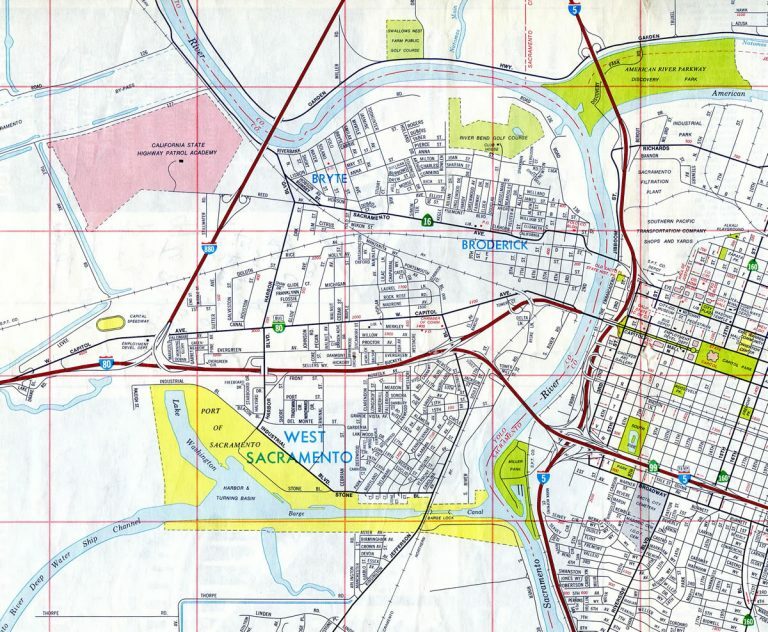 Old 1970s AAA maps of Sacramento displayed Business Loop I-80 along West Capitol Avenue. Prior to 2002, there was exactly one Business Interstate 80 shield in the city of Truckee, and the business loop was only marked off of Interstate 80 heading westbound. When the signs were replaced in 2003-2004 as part of the reconstruction of I-80 near Truckee, all remaining references to the business loop were removed. Interstate 80 and Donner Park overcrossing over Donner Pass Road and California 267 to Interstate 80 and Legislative California 89/California 267 Separation. The route today is signed as Historic U.S. 40.
Business Loop I-80 through Verdi forms a 4.5 mile arc from Exit 5 west to Exit 1. The eastbound beginning starts at Exit 2, while the southernmost extent comprises a west side frontage road to I-80. The business route runs concurrent with semi-signed Nevada 425. Supplemental signs reference the business loop in each direction of the Interstate 80 mainline. The Reno-Sparks business route from I-80 follows an east-west alignment on Fourth Street in Reno and Victorian Drive in Sparks. Beginning at Exit 12, the business loop follows a commercialized stretch of Keystone Avenue south from I-80 to 4th Street. Business Loop I-80 then follows 4th Street (old U.S. 40) east with local maintenance through Downtown Reno to the Sparks city line at Galletti Way. There it becomes SR 647 (Prater Way) through a diamond interchange (Exit 16) with Interstate 80. The remainder of the route in Sparks parallels I-80 just to the north along Victorian Avenue. The east end ties into the McCarron Boulevard (SR 659) parclo interchange (Exit 19) with Interstate 80. A handful of signs stand along the route through Sparks while the business loop through Reno is vastly unsigned. 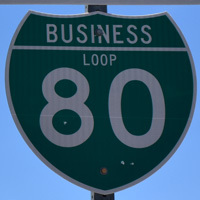 Business Loop I-80 meanders 7.2 miles north from I-80 into Wadsworth and south to the city of Fernley along old U.S. 40. The business route overlaps with Nevada 427 east from Exit 43 to U.S. 50 Alternate & 95 Alternate in Fernley. Main Street carries the three routes east to a roundabout to Nevada 828 (Farm District Road). There Business Loop I-80 & U.S. 95 Alt branch northeast to Interstate 80 at Exit 48. Signs on the I-80 mainline omit the business loop and SR 437 for Wadsworth. The east Fernley exit acknowledges Business Loop I-80 with a stand alone shield assembly ahead of the westbound off-ramp. 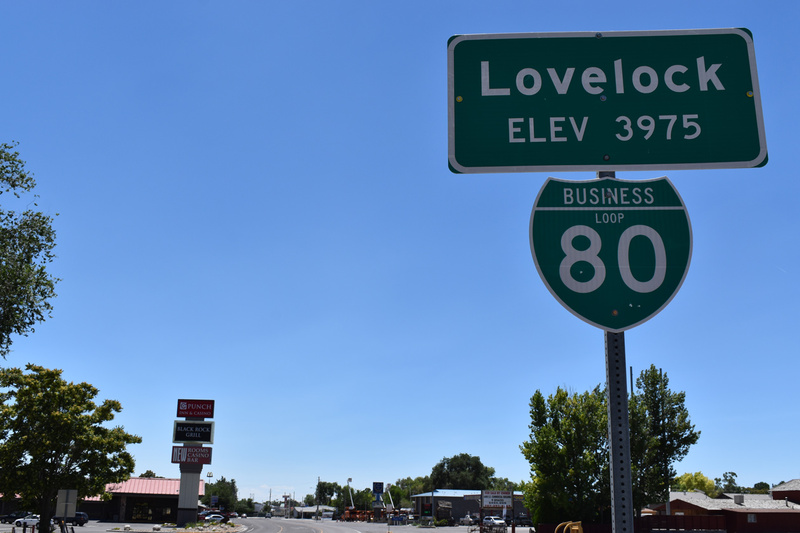 The Lovelock business loop was formally approved by the AASHTO Route Numbering subcommittee on April 7, 2000, even though it had been signed throughout the 1990s. Totaling 1.6 miles, Business Loop I-80 runs along old U.S. 40 & 95 on SR 396 (Cornell Avenue) north from Exit 105 to SR 856 and a half diamond interchange at Exit 107. This business route follows old U.S. 40 along Winnemucca Boulevard for 7.5 miles. The western part of this route is cosigned with SR 289 as it parallels I-80 closely from Exit 173 to Exit 176, where U.S. 95 departs the freeway for Downtown Winnemucca via Business Loop I-80. U.S. 95 turns northwest along Melarkey Street while SR 289 remains along Winnemucca Boulevard to Exit 178. Business Loop I-80 turns just prior to that interchange and overlaps with SR 794 by the Humboldt County Fairgrounds to end at Exit 180. The Battle Mountain business loop follows old U.S. 40 along Front Street through the unincorporated community. The route runs concurrently with Nevada 304 for 3.4 miles. End shields are posted at both Exits 229 (Allen Road) and 233 (Hill Top Road). Part of hidden Nevada 221, this business loop follows Chestnut Street (Old U.S. 40) through Carlin. Traveling 3.0 miles overall, Business Loop I-80 begins at SR 278 and Exit 279 to the west and ends at Susie Creek Way and Exit 282 to the east. One of the larger cities between Reno and Salt Lake City, Business Loop I-80 through Elko joins portions of old U.S. 40 along a 5.5 mile route. The drive east from Exit 298 to SR 227 (5th Street) in Downtown Elko is state maintained and designated as SR 535. The route northeast along Idaho Street to Jennings Way and Exit 303 is locally controlled. Business Loop I-80 through Wells navigates along the main streets through the city, Humboldt Street and Sixth Avenue (old U.S. 40). The 2.6 mile loop overlaps with SR 223 north from Exit 351 and east to U.S. 93 (Great Basin Highway). The east end separates between ramps from U.S. 93 south to I-80 east and from Exit 352B west onto 6th Street. The 2.9 mile route co-signs with U.S. 93A in Nevada and with SR 58 east to Exit 2 in Utah. 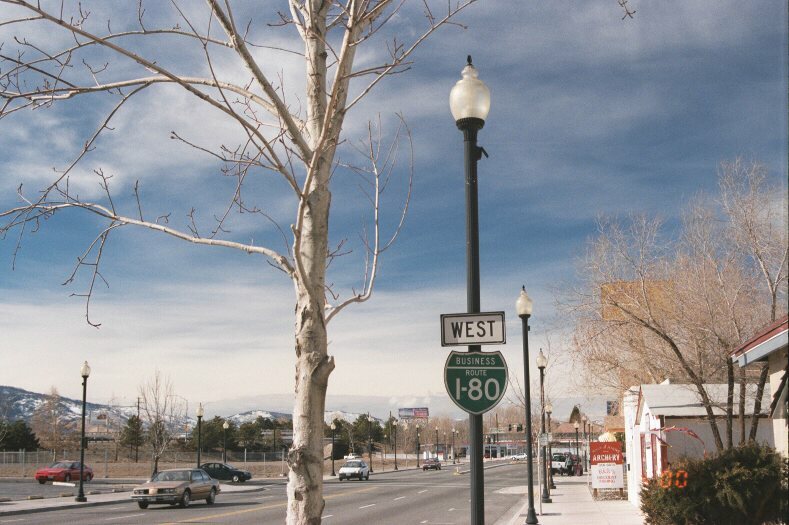 The Wendover Boulevard section of Business Loop I-80 between the U.S. 93A junction and the state line is locally controlled; it was formerly designated as Nevada 224. A number of casinos along this stretch offer the closest gambling opportunity for residents of Salt Lake City. U.S. 93 Alternate splits with I-80 at Exit 410 to connect with Lincoln Highway south via the business route otherwise. The Utah portion is only marked with one shield for SR 58 westbound. The State Road Commission approval of the Interstate business route policy in 1973 referenced a number of cities across Utah that qualified for business loops and spurs. Many were implemented, but some were not, including the potential Business Spur I-80 at the city of Coalville.3 The short route might have taken SR 280 (100 South) east from Exit 162 to Main Street (old U.S. 40 & 189). Evanston represents the first traveler services along Interstate 80 since the merge with I-84 at Echo Junction. There Business Loop I-80 overlaps with U.S. 189 Business along a 3.2 mile route across the city from Exits 3 to 6. Replacing U.S. 30S, the business route follows Harrison Drive east to Front Street south through the city center. Wyoming 89 combines with the route at 6th Street as the loop turns north onto a viaduct connecting with Bear River Drive. Bear River Drive returns the business route pair east while WYO 89 ventures north to Bear River. This business route follows old U.S. 30S through Bridger Valley, a group of small Mormon settlements between Evanston and Green River that include Fort Bridger, Urie and the town of Lyman. Located between Exits 34 and 48, the 15.7 mile business route is the longest in the state of Wyoming. Named Flaming Gorge Way, Business Loop I-80 through Green River is co-signed with U.S. 30 Business and marked with trailblazers for WYO 530 south. The 2.5 mile route is a bypass for vehicles prohibited from passing under the Castle Rock tunnels along Interstate 80 & U.S. 30 between Exits 89 and 91. Interstate 80 and US 30 east approaching Green River …. the tunnels were fully open this summer (no lane restrictions). Taking a winding route for 4.1 miles, the Rock Springs business route for I-80 arcs east from Exit 102 along the commercial arterial of Dewar Drive to Center Street. Business Loop I-80 & U.S. 30 Business continue east from Elk Street along Bridger Avenue and Pilot Butte back to Interstate 80 at Exit 107. This business route branches north from I-80 at Exit 211 along side U.S. 30 Business & Wyoming 789 (Cedar Street) to the Rawlins city center. There WYO 789 turns north onto 3rd Street as U.S. 287 south combines with the business routes. The trio run south three blocks to Cedar Street, which directs them eastward to a trumpet interchange with I-80 at Exit 215.
Business Loop I-80 through Laramie stems east 1.3 miles from Exit 310 along Curtis Street to U.S. 30 & 287 (3rd Street). 3rd Street, a four to five-lane commercial boulevard, takes all three routes south 1.1 miles to Grand Avenue at the city center. The eastern four miles of the business route travel solo on Grand Avenue to the University of Wyoming campus, War Memorial Stadium and growing suburban areas to rendezvous with Interstate 80 at Exit 316. Serving Wyoming’s capital city, Business Loop I-80 doubles as U.S. 30 (Lincolnway) along a 6.9 mile artery. 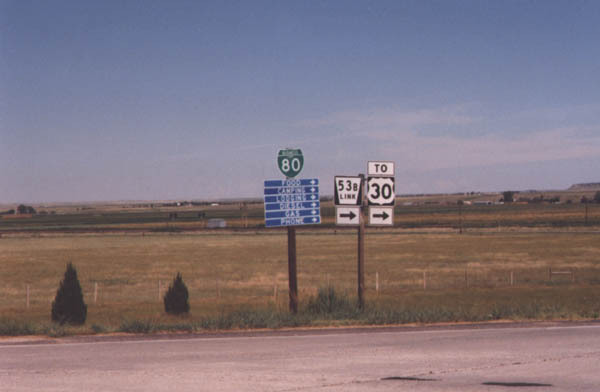 The route separates with I-80 on the western outskirts of Cheyenne at Exit 358, opposite WYO 225 (Otto Road). The initial stretch of Lincolnway parallels a Union Pacific Railroad corridor east as a four-lane divided highway by a number of motorists services and business parks. Shifting into the Cheyenne street grid, Business Loop I-80 & U.S. 30 transition into a five-lane boulevard to Downtown, where they intersect Interstate 180, Business Loop I-25 & U.S. 85-87 Business. This rare meeting of two Interstate business routes coincides with the north end of the I-180 expressway leading south to Exit 352. Continuing east, Business Loop I-80 & U.S. 30 wrap around Holliday Park to a business district across east Cheyenne. The two routes separate by Cheyenne Plaza Shopping Center, with U.S. 30 remaining east along Lincolnway to growing suburban areas and Business Loop I-80 combining with WYO 212 (College Drive) south to reconnect with I-80 at Exit 364. The final business route for I-80 follows Parsons Street and Lincoln Highway (old U.S. 30) through the town of Pine Bluffs. Beginning opposite the Wyoming welcome center at Exit 402, the business route overlaps with U.S. 30 Business to the state line and the intersection with Link 53B. U.S. 30 turns south from Bushnell along L-53B to merge with I-80 at a rural diamond interchange. Business Loop I-80 was omitted from Interstate 80 mainline guide signs in both states by 2005. Two shields remained in 2009 along the Nebraska side of the loop at both the westbound off-ramp (Exit 1) from I-80 and at the north end of Nebraska L53B. They were taken down by 2012, reflecting a likely decommissioning of the route in the Cornhusker State. Several assemblies for Business Loop I-80 & U.S. 30 Business were posted by 2012 in Pine Bluffs, Wyoming. These appear along Parsons Street at WYO 215 (8th Street) and at the turn of the loop east onto Lincoln Highway (old U.S. 30). 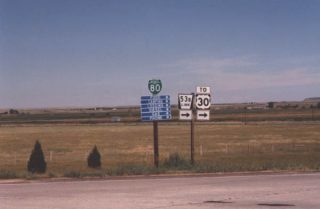 The nine mile route of Business Loop I-80 through Sidney served the largest city along the I-80 corridor between Cheyenne, Wyoming and North Platte, a distance of 210 miles. The business route overlapped with Nebraska 19 north from Exit 55 to U.S. 30 (Lincoln Highway) east through the city center to Nebraska L17J south back to I-80 at Exit 59. Routes 73 through 80. California Highways web site (Daniel Faigin). “Re: District 3/Sacramento – Sign Replacement Project” online posting by jrouse, AARoads Forum, September 26, 2015. “Utah Okays Business Loop Policy.” The Deseret News, April 30, 1973. “I-80 Sidney Nebraska Business Loop decommissioned” online posting by corco, AARoads Forum, April 2, 2009. U.S. 40 Business assigned to West Capitol Avenue – 1963 Gousha map of Sacramento. This route may have been the predecessor of the first Sacramento business loop for Interstate 80. Reassurance marker for Business Loop I-80 west along Victorian Way (old U.S. 40) through Sparks, Nevada. Photo taken by Jeff Royston (01/14/00). One of two shields for Business Loop I-80 formerly posted for the Pine Bluffs, Wyoming business route along L-53B in Nebraska. Photo taken 08/98.